Five members of the Eighth Texas Calvary, also known as Terry's Texas Rangers. Image available on the Internet and included in accordance with Title 17 U.S.C. Section 107. Benjamin Franklin Terry. Image available on the Internet and included in accordance with Title 17 U.S.C. Section 107. 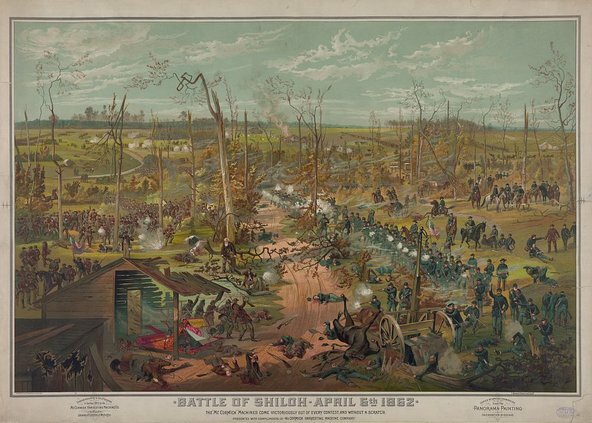 Painting, Battle of Shiloh. Courtesy of The New York Times. Image available on the Internet and included in accordance with Title 17 U.S.C. Section 107. General Joesph E. Johnston. Image available on the Internet and included in accordance with Title 17 U.S.C. Section 107. EIGHTH TEXAS CAVALRY [TERRY'S TEXAS RANGERS]. The Eighth Texas Cavalry, a group of Texas volunteers for the Confederate Army popularly known as Terry's Texas Rangers, was assembled by Benjamin Franklin Terry in August 1861. Each man was required to furnish a shotgun or carbine, a Colt revolver (see COLT REVOLVERS), a Bowie knife, and a saddle, bridle, and blanket. The army would provide the mounts. The regiment was mustered into Confederate service at Houston on September 9, 1861. Terry was elected colonel, Thomas S. Lubbock lieutenant colonel, and Thomas Harrison major. With the death of Colonel Terry at the battle of Woodsonville, Kentucky, on December 8, 1861, Lubbock, then sick in a Bowling Green, Kentucky, hospital, was advanced to command of the regiment, but he died within a few days. Subsequently, John Austin Wharton was elected colonel and John G. Walker lieutenant colonel of the regiment. When Wharton was promoted to brigadier general in the fall of 1862, Harrison became the regimental commander; he served in that post until the end of the war. Although the regiment had been promised duty in Virginia, it was diverted to Bowling Green, Kentucky, at the request of Gen. Albert Sidney Johnston, who was in command of the Confederate army headquartered there. The Terry Rangers distinguished themselves at the battles of Shiloh (April 6–8, 1862), Perryville (October 8, 1862), Murfreesboro (December 31, 1862–January 2, 1863), Chickamauga (September 19–20, 1863), and Chattanooga (November 24–25, 1863); in the Atlanta campaign (May 1–September 2, 1864); and as raiders in Kentucky and Tennessee under Lt. Gen. Nathan Bedford Forrest. The rangers were also part of the inadequate force under Gen. Joseph E. Johnston that attempted to slow Maj. Gen. William T. Sherman's inexorable "march to the sea" during the final months of the war. Terry's Rangers delivered what was probably the last charge of the Army of Tennessee at the battle of Bentonville (March 19–20, 1865). Rather than surrender with the rest of Johnston's army at Durham Station, North Carolina, on April 26, 1865, 158 of the reported 248 survivors of the regiment slipped through Union lines to join other Confederates yet in the field. With the total collapse of the Southern cause, however, the Terry Rangers drifted home as individuals and in small groups, having never officially surrendered. With the exception of Hood's Texas Brigade, the Eighth Texas Cavalry was probably the best-known Texas unit to serve in the Civil War. It earned a reputation that ranked it among the most effective mounted regiments in the western theater of operations. James Knox Polk Blackburn, Reminiscences of Terry's Texas Rangers (Austin: Littlefield Fund for Southern History, University of Texas, 1919; rpt., Austin: Ranger Press, 1979). Thomas W. Cutrer, ed., "`We Are Stern and Resolved': The Civil War Letters of John Wesley Rabb, Terry's Texas Rangers," Southwestern Historical Quarterly 91 (October 1987). William Andrew Fletcher, Rebel Private, Front and Rear (Austin: University of Texas Press, 1954). Leonidas B. Giles, Terry's Texas Rangers (Austin: Von Boeckmann-Jones, 1911). H. W. Graber, The Life Record of H. W. Graber, A Terry Texas Ranger, 1861–1865 (1916; facsimile, A Terry Texas Ranger, Austin: State House, 1987). Handbook of Texas Online, Thomas W. Cutrer, "EIGHTH TEXAS CAVALRY [TERRY'S TEXAS RANGERS]," accessed April 24, 2019, http://www.tshaonline.org/handbook/online/articles/qke02. Uploaded on June 12, 2010. Modified on March 13, 2018. Published by the Texas State Historical Association.